Nowadays jeans are often regarded as the role model for all trousers. As you might know, I do not mind wearing denim occasionally, but when it comes to country classics like corduroys and moleskins, I prefer a slightly different cut. And with trousers, it all starts from the waist. As you might have noticed, the summer most seriously inflicts my weblog productivity. 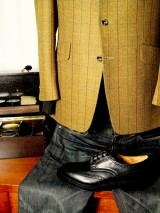 However the tweed season is not too far away, and for yours truly this means a significant revitalisation. So, let me know what you want to know about country style, and I will address those matters in my forthcoming posts. Now and then, the denim controversy flames up. Is the denim jean acceptable to the style conscious gentleman or should it be avoided like patent leather boat shoes? Of course, for all but the most narrow minded, jeans are an essential part of today´s wardrobe. 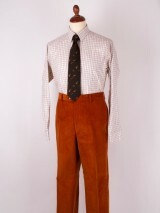 Though they may seem puzzling to the conservative, these work wear trousers can be so easily mixed with the classic garments as to almost (but only almost) be regarded a classic in itself. 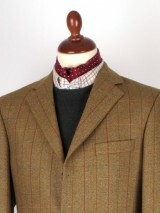 I have noticed a slight hesitation from Scandinavians to use the most informal neck-wear of country style – The Cravat. Although most agree it can look stunning, not everyone think they can pull it off without looking overly snobbish. Hopefully some encouragement and advice from yours truly will get you into cravat action! If you have a pair of London best guns, the choice is obvious. In addition to your original oak and leather gun case, you need a pair of best quality leather gun slipsA soft sleeve to protect your gun in the field. Traditionally in canvas or leather., preferably in London tan or Havana brown colour, to protect your precious guns in the field. However, for the slightly less exclusive gun, the choice is not so obvious.